Our vision at Tico Sighting is to offer cutting edge, technology-driven, creative solutions by delivering 2D/3D, VR, immersive and interactive experiences. Creative projection mapping and Optoma laser projectors light up a vintage B-25 Mitchell bomber. Descending from the sky, the “Ghost Ride” tells the story of a ghost plane and its pilot. The EDC crowd experiences an immersive and memorable projection experience. 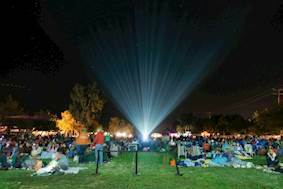 Задача: Create an innovative video display that visually tells a story to the festival crowd, using an historic airplane as the projection surface and backdrop. 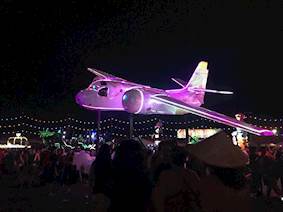 Решение: Using a vintage B-25 Mitchell bomber from the 1940’s, projection mapping ingenuity and Optoma laser projectors, Tico Sighting brought an illusion to life to tell the story of a ghost plane flown by a ghost pilot. Результаты: Overcoming unique installation challenges where brilliant, reliable and true-to-life imagery was key, Optoma laser projectors helped deliver an immersive and memorable viewing experience. An annual electronic dance festival with its flagship event held in Las Vegas, Nevada, Electric Daisy Carnival, commonly known as EDC, draws crowds in the hundreds of thousands each year. Featuring electronic dance producers and DJs, the rhythmic and all-welcoming festival brings people together under the electric sky in a musical celebration that lasts from dusk until dawn. 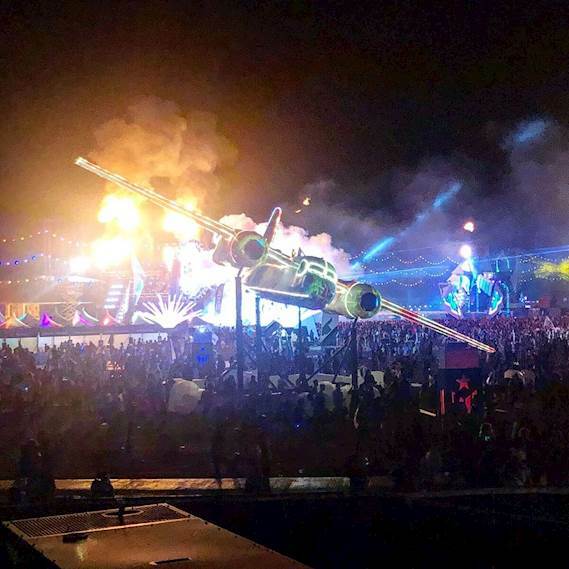 Looking to create an innovative visual experience within one of the festival’s many set designs, integrators Virginia Barach and Tico Acosta from Tico Sighting wanted to use a vintage 1940’s B-25 Mitchell bomber airplane in their design and showcase it descending from the clouds. On its descent, and all to the beat of festival music, the visual display would tell the story of the ghost plane and its pilot. Knowing their “Ghost Ride” concept would mean a massive display of forms and brilliant imagery, they turned to Optoma to help tell their unique visual story and bring the ghost plane to life. Hoping to create an infinity mirror effect, Tico Sighting installed disks of plexiglass with projection film in each of the plane’s engines. They then used projection mapping software and Optoma ProScene ZU1050 and ZU850 laser projectors to simulate working propellers. Using the same approach, they creatively installed additional Optoma laser projectors on projection platforms, this time projecting against the plane’s body and surface as their inventive backdrop and screen. 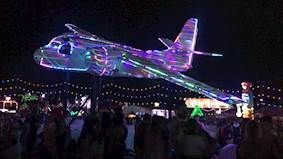 The creative combination of stimulating simulation video content, projection mapping and ultra-bright laser projection resulted in a life-sized illusion of a plane that was operating and in motion, turning the vintage war plane into a living work of art. Boasting 10,000 and 8,000 ANSI lumens respectively, an impressive 2,000,000:1 contrast ratio and 20,000 hours of virtually maintenance-free operation, Optoma’s ZU1050 and ZU850 laser projectors were an ideal choice for the festival’s demanding installation environment. A variety of lens options, motorised lens-shift, zoom and focus with 360 degree and portrait operation also helped ensure installation flexibility. Creating a memorable visual display that captivated the festival’s audience, Tico Sighting’s aerial narrative brought the audience together in a celebration of storytelling and sound.